Assured Health Insurance Services, of California, is the subject of this health insurance review. The company should not be confused with Assured Insurance Agency based in Cleveland, Ohio. The California-based company offers a variety of insurance products to individuals and businesses in California. Their list of products includes, but is not limited to, disability insurance, life insurance, and group health coverage. Find out what health insurance rates are in your area by entering your ZIP code now. Assured Health Insurance Services (AHIS) has been in business in California for more than 50 years. They specialize in health insurance and are among the most respected providers in their state. The secret to their success is their belief that developing personal relationships with clients is of utmost importance. AHIS cultivates those relationships regardless of whether or not the client is an individual or a business. AHIS does not utilize their own network of individual agents. This is because they are themselves an agency representing dozens of larger insurance carriers. As an agency, they are able to find the best policy for each individual customer among the many carriers they represent. They are also able to act as an intermediary of sorts in dealings between carrier and customer. This type of business model is not as prominent in health insurance as it is in home and auto insurance, but AHIS makes it work. 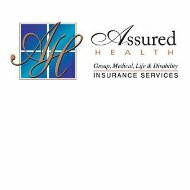 Assured Health Insurance Services provides four different quote tools on their website depending on the type of insurance you are looking for. Health insurance can be purchased as an individual plan, a group plan, or a plan for children only. They also offer a quote for individual life insurance policies. To get a quote you simply click on the appropriate link on the website, enter your ZIP code, and click the submit button. The website will then ask you for more specific information to compare against the various policies the company offers. The quote process returns results based on the various companies AHIS represents. Examples of those companies include Aetna, United healthcare, CIGNA healthcare, and Blue Shield. They also represent some other lesser-known companies that might be limited to the state of California. As an agent, Assured Health Insurance Services does not get involved in claims for health insurance. Claims would be filed according to the individual carrier the customer chooses. Some of the carriers use a direct billing model in which consumers simply make their co-payment at the time of service and are never involved in the financial transaction from that point forward. Others use a third-party system where the consumer pays out-of-pocket for his medical care and files a reimbursement claim with his carrier. Where the company’s life insurance policies are concerned, Assured Health Insurance Services may be willing to be involved in the claims process. Some life insurance carriers prefer claims begin at the agent level while others prefer direct contact. AHIS customers would need to look into that before purchasing a policy if the claims process is something that is important to them. At the very least, Assured Health Insurance Services can direct you in the proper method of filing a life insurance claim. As mentioned at the start of this review, AHIS prides themselves in good customer service. If their website is any indication, they seem to fulfill that goal rather well. The site is a plethora of information without being burdensome or cumbersome. For example, they offer a video library of instructional videos regarding health insurance and related topics. They also provide several different resources to prepare customers for the full implementation of healthcare reform in 2014. That particular feature is something we have not seen on any other health insurance carrier website. The company also provides a full list of names and e-mail addresses for various individuals within the agency. As long as individuals know specifically what their need is, they have direct contact without having to go through an automated switchboard. It is these types of little things that demonstrate Assured Health Insurance Services is indeed committed to good customer service. Search for the best health insurance rates online by entering your ZIP code now.